The very special Roadster presented here is a faithful recreation of a famous car that is steeped in rich Jaguar automotive history. 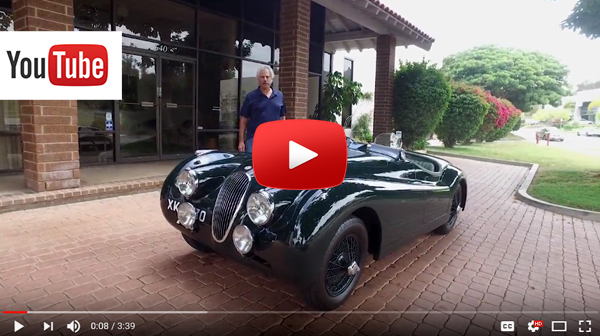 This XK-120 is a fantastic recreation of the famed LT1 factory roadster, and was the recipient of an exhaustive 15 year restoration by the top Jaguar professionals. 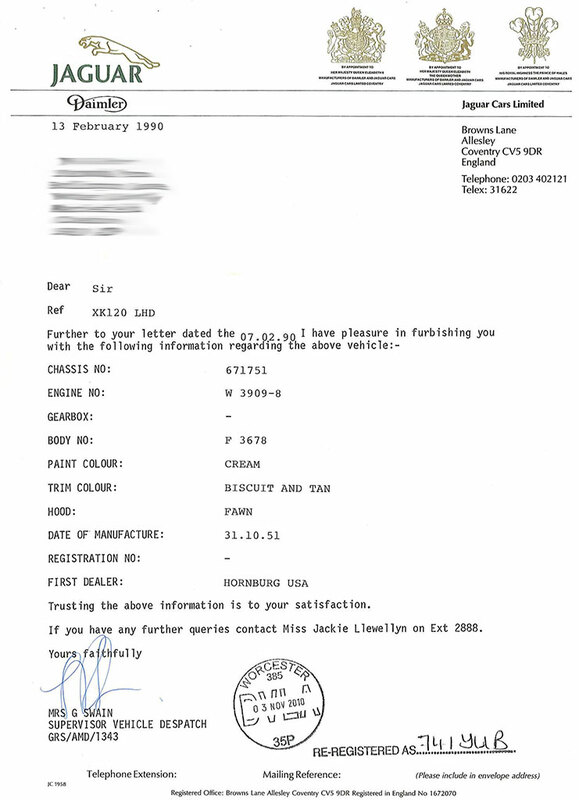 The roadster remained in the US until September 1989, when it returned to England and began what was a lengthy restoration to its present appearance. Original parts were gathered over a 15-year period, which saw a chassis rebuild by John Wood, while Aubrey Finburgh recreated a correct one-piece aluminum body and mounted it on a tubular steel “birdcage” inner frame. The roadster features sporty and roomy alloy bucket seats, as well as collapsible, aerodynamic Brooklands style windscreens, along with a set of painted wire wheels that match the car's British Racing Green finish. The absence of the bumpers further enhances the sleek and sporty look of the car. The XK-120 is powered by a proper C-Type-spec engine with twin sand cast SU carburetors, while the front brakes are cooled by air scoops. The roadster’s running gear was fully overhauled, its electrical system was rewired, and the original instruments were rebuilt. 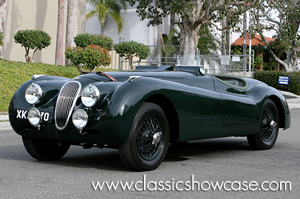 The car was converted to right-hand drive by noted Jaguar restorer Steve Grimsley, and recently, Jaguar experts at Classic Showcase installed a set of original Lucas driving lights, a battery cutoff switch, a 4-spoke wood competition steering wheel, and polished the car's aluminum engine components under it's louvered aluminum bonnet. In addition, our master technicians performed a full service to the car, ensuring it to be ready for rallys, showing and collecting. Finished in British Racing Green with Sage Green leather interior and registered in the UK as XKJ 470, this Roadster promises the same thrilling, hairy-knuckled ride that was provided to LT1’s original caretakers in the early 1950s, and presents a unique opportunity for the collector seeking a very unique and historical car for their collection. In 1951, William Lyons was preparing Jaguar’s new C-Type for entry at Le Mans. Doubtful that the completely new automobile would be ready in time for the race, Lyons ordered up three special Works-built XK120s as an insurance policy. These cars were the first XK120s since the initial run of 210 cars in 1949 and 1950 to have lightweight aluminium coachwork. They boasted tweaked lines with cut-down doors, rear sheet metal produced in a single piece, and Brooklands-type aerodynamic windscreens. Known as LT1, LT2, and LT3, the cars wound up not racing at Le Mans, as the C-Types were completed in time. They sat around Browns Lane until Charles Hornburg, the famous US West Coast Jaguar importer, spotted them during a visit. He promptly purchased the cars and exported them stateside, where Phil Hill masterfully drove one to 3rd overall and a class win in its very first race in August 1951. LT1 remained in England and went to Jaguar employee Bob Berry, who mounted its coachwork to an XK120 chassis that he already owned and installed a D-Type engine and four-wheel disc brakes. The car was eventually brought to North America and was exhaustively raced by the late Peter Price at various West Coast circuits. Today, LT1, restored to its original appearance, resides in a private collection.